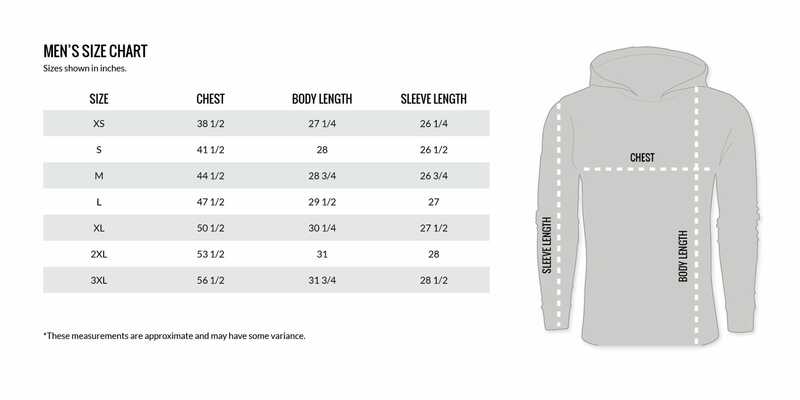 Vortex Grey Zip Up Hoodie is rated 4.2 out of 5 by 11. Caution: you may want to cover your current go-to hoodie’s eyes for this one because we just found its successor. With a three panel hood, embroidered design features, super soft and durable construction, and two-tone grey and black color combo - the only thing this zip up is missing is… nothing. The Vortex zip up hoodie was made to be your new favorite. Rated 4 out of 5 by RenoMD from Sizing a bit tricksy I went off the only review in the Large size...guy said it was super slim fitting and suggested that this was way too small for suggested size. Uh...yeah man not true. I'm 5'8", 150 lbs, muscular build mostly upper body. Wear a size small everything usually... except the vortex short sleeve shirt I have is a size medium. So I rolled the dice and got snake eyes...the medium was significantly big. Felt too big... was very long, super baggy. If your into that get a medium. BTW, I wear a 38S suit jacket for reference, and this fits perfect. 36S suit jackets I can wear but have that super tight hipster look which i'm not fond of. So I returned it and got the small. Rated 5 out of 5 by RickB from Vortex Zip Up Hoodie I recently bought the Vortex Zip Up Hoodie to wear out and about, and as a mid layer under my hunting jacket. I am 6'3" and roughly 185-190 pounds and the large fits me perfect. I also like the slimmer cut design so I can use it as a layer without the bulk. Not sure on the earlier comments about the zipper issues. I have had no trouble using the zipper in my hoodie. However, I am also an avid cyclist and used to using European Style zippers in garments. LIke other comments left, my wife wanted to know where was hers. Looks like I will need to get her one ordered before she decides to steal mine. No complaints on the hoodie as far as function, workmanship, or etc. Vortex did a good job on this one. An interior storage pocket could be cool though. Rated 1 out of 5 by Drjay from Is this for women? I wear large t shirts, jackets, coats etc. I ordered this hoodie in large. It has a European zipper as it states which is basically the same side womens buttons and zippers are on. No big deal right? It is also "princess cut" meaning it is very very fitting in the waist then swells out for the chest area. If I was limp wristed I would where this hoodie. Anyways I guess my wife is gonna get this. one. Rated 5 out of 5 by JesseTischauser from My New GoTo Hoodie for Fall I'm a big fan of the zip off hoodie simply because you don't have to remove your hat, glasses and ear pro to remove them while out hunting or shooting. The vortex hoodie is perfect. The style, cut and logos on this hoodie are like all my Vortex gear, straight up cool. The hoodie fits true to size. It's not a big bulky overweight hoodie. It has an average to athletic cut which I enjoy. The one thing I really enjoy is the sleeves aren't too short. So when I put my arms up when shooting it doesn't feel one size too small. One older I read review mentioned a European or American female style zipper which I've used previously and it was ok but annoying. This hoodie has a typical American Male zipper style. So they must have changed the supplier or the whole thing up. I don't have one thing negative to say about my new go to fall hoodie. In fact as I was trying it on my wife said, "where's mine, jerk?!?!" So I guess I'll be ordering one for her next. Rated 4 out of 5 by JimmyA WV from Great jacket. I've had this zip up hoodie for a little while now and I really like it. Compared to the performance hoodie, it does fit a little snug. I am 6'2", 200lbs and the Large fits fine just not as much play as a few other shirts I own from Vortex. I do not mind the zipper but it does zip up on the opposite side like a women's shirt. Rated 5 out of 5 by Benny from Perfect Fit I've just taken delivery of my new medium Vortex hoodie and it fits perfectly. I'm 6'2" tall and a slim build at 77kgs. I'd say I have fairly long arms and the sleeves are a great length. This size was a great fit for me without being to baggy or too tight. Thanks Stephanie at Vortex, greatly appreciate your help on sizing. Rated 4 out of 5 by Otis from Decent zip up Hoodie This zip up Hoodie has a sharp look to it and is fairly comfortable. I wear a size large and it seems to be more "athletic" or snug fit. I wear a size large and the hoodie is snug but by no means small. I don't mind the zipper even though it backwards. Still a nice hoodie and I would get another if I needed to.